Great value, high quality Xenta Cable. This is exactly the same cable as the previous plexus stock but we are now using the Xenta name on cables. Please buy with confidence. What is a Category 5e patch cable? Think of it as the street that links the house on your block and all the destinations in town. In actuality, it's a cable used to connect all the hardware destinations in a Local Area Network (LAN). 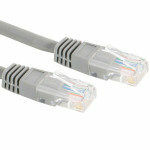 The RJ45 Cat 5e patch is perfect for use with 10/100 BaseT networks. We are so confident in the quality of our cables that we supply a LIFE TIME WARRANTY. cable also supports ordinary 10 and 100 Mbit/s Ethernet.